Our professionals specialize in transplanting trees. Whether it’s across your yard or across town, you can count on Ada Tree Service to get the job done! 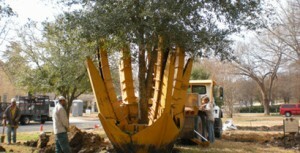 We care about your satisfaction, your yard, and the end result as much as we care about our trees. When we’re finished with the installation or transplantation, your yard will look as good as it did before our arrival, except it will now be enhanced by your selection of trees, growing as though they have been there their whole life!